22 May 2018 // A training on the Convention on the Rights of People with Disabilities (CRPD) and the Sustainable Development Goals (SDGs) took place in Kampala, Uganda, from 10-18 of April. The so called Bridge CRPD-SDG training was organised by the African Disability Forum (ADF) and the National Union of Disabled Persons Uganda (NUDIPU), with the support of the International Disability Alliance (IDA), the International Disability and Development Consortium (IDDC) and their members. Rebecca Opetsi, IF fellow and trainer of trainers, was invited to participate in the event as a Bridge Alumni and facilitator to learn how to be a lead Bridge CRPD-SDG trainer next year in Tanzania. The workshop included detailed analysis and examination of key concepts of the CRPD and SDGs focusing on inclusion and accessibility. At the start of the training, a Facilitation Team worked on how to ensure a smooth preparation for the week’s activities, using tools of inclusive facilitation. 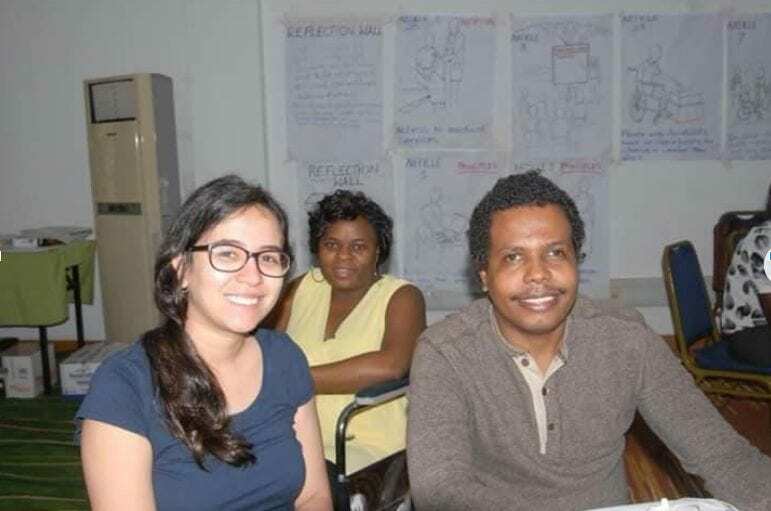 On April 11, they spend a full day training the participants from underrepresented groups, in particular, the ones that are resource persons for the marginalised groups. By following the training they can become better advocates for inclusion and realisation of rights of persons with disabilities. In total, 70 people participated in the workshop from English, Portuguese, French, Arabic and Swahili speaking countries. The participants represented a wide range of organisations of persons with disabilities, including persons with intellectual disabilities, deaf-blindness, psychosocial disabilities, hearing impairments, as well as multiple impairments like spina bifida and hydrocephalus. Find more information about the workshop here and watch this movie to know more about Rebecca’s role as an IF fellow.